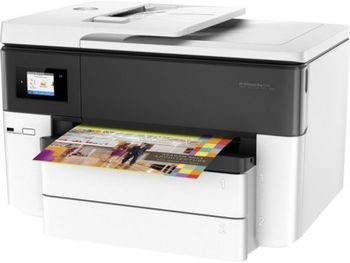 The HP OfficeJet Pro 7740 MFP is aimed at small businesses. This is an A3 inkjet device equipped with a single-pass / dual-head scanner in the feeder. It can print on to paper up to 21.6cm (8.5 inches) x 35.6cm (or 14 inches) and runs at up to 22 ppm (A4) in black and white, and up to 18 ppm in color with a maximum resolution of 4800 x 1200 dpi. HP are emphasising how well the machine is suited for mobile users. The HP OfficeJet Pro 7740 supports AirPrint and Mopria, so Android and iOS users can print without the need to install anything. In addition, the HP Private Print service allows JetAdvantage to store sensitive documents on the cloud. It also allows to edit these documents once the user is authenticated from the machine. Find more information soon on this machine on Your DMO.